Keeping winter clothing stylish, in today’s article we will be introducing you to Naketano, the German brand that manufactures a variety of outdoors clothes, such as jackets, hoodies, pullovers and overalls. With good reviews and a well-established reputation for quality, this selection for women will surely make you want to have them all. 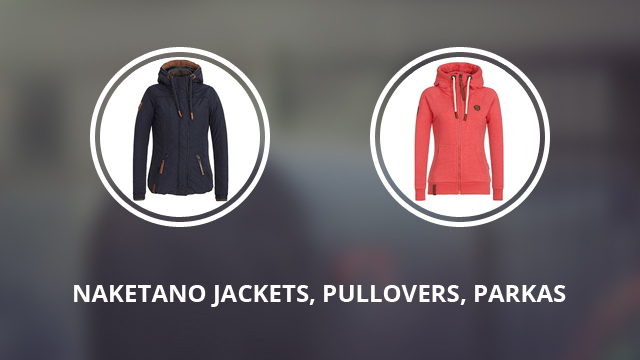 The selection will include various clothing suitable for mild to freezing temperatures. We will start with the hoodies, pullovers and then move on to the jackets and conclude everything with the parka, so you will have a choice for both autumn and winter seasons. 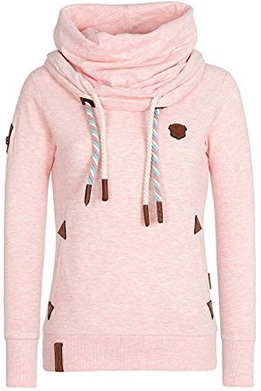 Let’s get started with the hoodies, which, must be said, come in an abundance of colors, as you will see in each description. Darth VIII is a chic hoodie, made of 65% Cotton and 35% Polyester. This combination makes for a warm hoodie, while also quite breathable. This is a normal fit cut, which you can wear with clothes underneath and it is a good choice if you are looking to keep the jackets solely for winter and want to spend the warmer days dressed lightly. The hood is adjustable with drawcords, which are placed more to the right, rather than the typical positioning in the center. 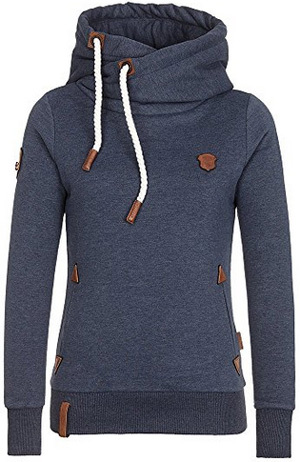 It is a closed hoodie, with two side pockets and leather patches for decoration. As for the color selection, it includes 20+ options, some of which are: Dark blue, Amazing blue, Amazing grey, Black, Green, Raspberry, Sky blue, Purple, Orange and Cherry. Next, it’s Brazzo VII, another hoodie made of 65% Cotton and 35% Polyester. This one opens to the front with a zipper and comes with long, elastic cuffs. The hood is lined on the inside and adjusts with drawcords. There are two slide pockets on the sides, with inner lining to quickly warm up the hands. It is a normal cut and comes with leather details and logo patches. There are 20+ colors available for this hoodie, such as: Cherry, Black, Anthracite, Dark ash, Forrest, Purple, Dark blue and Dark grey. Continuing now with the two pullovers for this selection, the first one is a mix between a hoodie and a pullover. 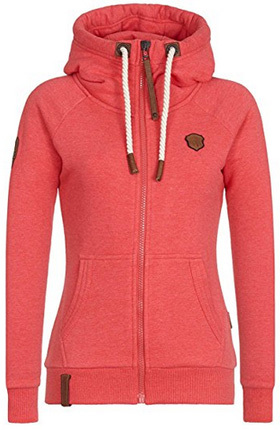 It is made of 65% Cotton and 35% Polyester, with the inside lined with fleece for added warmth. The hood adjusts with diagonal drawcords, which add to the design. It comes with two open pockets, with leather patches on each end. There are other leather details on the chest, hem and sleeve as well. Both cuffs and the hem are made of ribbed, elastic material, which makes for a more comfortable fit. There are 15+ color options, such as: Black, Indigo blue, Amazing grey, Light blue, Bordeaux, Ash grey, Raspberry and Lime. A definite beauty, this model is called Reorder VI and it comes with a wrinkle-style collar, perfect for windy days as it can be adjusted to fit around the neck and fully protect it. There are two open pockets on the sides and hem and cuffs made of elastic, ribbed material. Following along the same lines as the previous options, this one also comes with leather patches and details all over. It is made of 65% Cotton, which makes the outer part and 35% Polyester, as an inner lining, that provides warmth and insulation. The drawcords on the collar are also in double pairs, one of which comes in a twisted style, with two colors. This sweatshirt comes in 4 color options: Black, Candy pink, Dark blue and Nasty oma. Time for the jackets, we’re starting with the lightest one, a 100% Polyester jacket, with an inner lining made of fleece. This model is Gigi Meroni III. 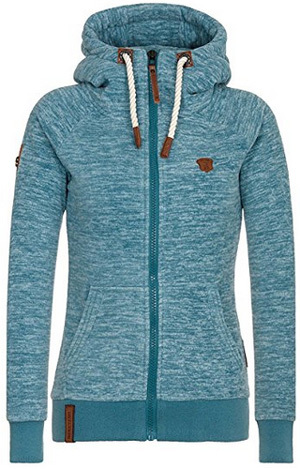 This is a hoodie-like jacket, suitable to be worn as an autumn or layering jacket. The side pockets are kangaroo design, lined for quicker warming of the hands. 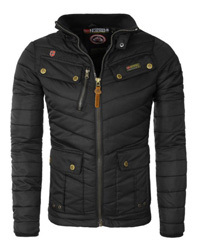 It comes with a hood, which is adjustable and leather brand logos. The cuffs and hem are made of ribbed and elastic material, while the main zipper is water-resistant and uncovered. There are 10+ colors available: Light blue, Candy red, Sky blue, Raspberry, Forrest, Dark blue, Grey, Indigo blue, Anthracite, Dirty Indigo, Black and Blue. This next model is called Dope is Hope and it comes in a casual style, with a covered and water-resistant main zipper. 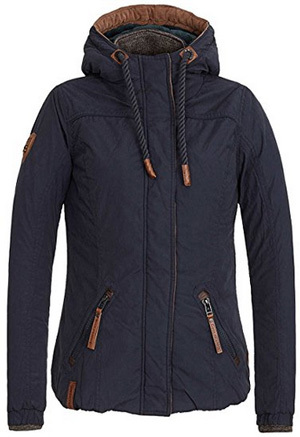 The material is 52% Cotton and 48% Nylon for the outer shell, while the inside is lined in teddy fleece, which makes this a great winter jacket as it is light but very warm. It has a hooded collar, with drawcords for adjustment. There are two zipper pockets on the sides and elastic cuffs for insulation. This is a normal fit jacket with an adjustable hem. The color options are: Dark blue, Sand, Dark green and Black. A longer jacket, perfect for rainy days and windy weather, it is the Naketano’s Schlaubär II design. 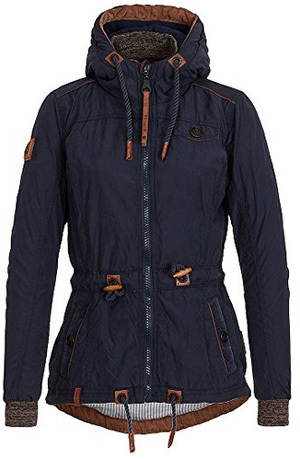 This jacket is made of 52% Cotton and 48% Nylon and comes in a trench coat design. 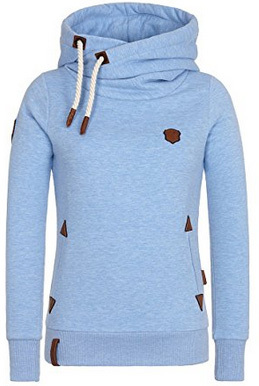 It has three adjustment points: the hood, the waist and hem, to not only make it fit better, but also insulate the jacket for the cold and dampness. The cuffs are extended and made of soft, knitted material, as is the inner lining on the collar. 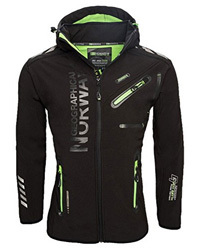 The main zipper is uncovered and it comes with several pockets, such as the two snap button pockets on the sides, the flap pocket on the chest and one inner pocket. It has wooden stops on the drawstrings and leather logos and patches. The hem is in a low-high design, with the back longer than the front. It comes in the colors: Dark blue, Ocean blue, Raspberry. Black, Dark green, Sand and Deep blue. Procrastinator is the last item of this selection, a winter parka made of 74% Cotton and 26% Nylon. The padding and inner lining are 100% Polyester. 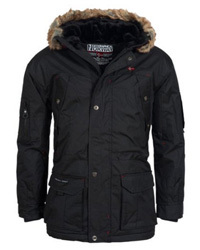 It comes with a lined hood, which has faux fur trim around. The inside is lined with teddy fleece, a soft and warm material. 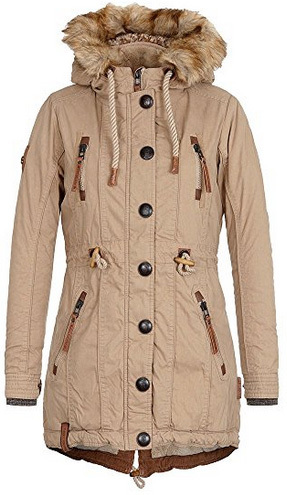 It is a long parka, with a low-high hem, adjustable at the back. It comes with adjusting drawstrings around the waist, with wooden button stoppers. There are two zipper pockets on the sides, two chest pockets and one inner pocket. The outer cuffs are elastic, whereas the inner ones are made of warm and soft knitted material. 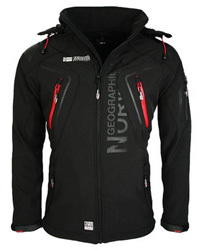 It has a covered main zipper and leather detailing on the zippers, hem and logos. The color options are: Black, Caramel desert, Deep blue, Dark green and Sand.